Chi legge da internet clicchi questa pagina (855 KB). La missione STS-114 ritorna nello spazio oltre due anni e mezzo dopo la precedente STS-107, culminata il 1 febbraio 2003 con la perdita in fase di rientro dello space shuttle Columbia e di tutti i membri del suo equipaggio. Il Columbia esplose in volo a pochi minuti dall'atterraggio sulla pista di Cape Canaveral, causando la morte di tutti e sette i membri dell'equipaggio: Rick D. Husband (comandante della missione), William C. McCool (pilota), David M. Brown, Laurel B. Clark e Kalpana Chawla (specialisti della missione), Michael P. Anderson (payload commander), tutti americani, e Ilan Ramon (israeliano, payload specialist). Chi desiderasse approfondire l'argomento legga l'articolo "Là dove non osano le aquile..." parte 1 e parte 2. Il Launch Pad 39B ripreso prima del lancio dello space shuttle Discovery a Cape Canaveral, il grande complesso di sostegno e supporto dello shuttle. La missione STS-114 ritorna nello spazio oltre due anni e mezzo dopo la precedente missione, culminata con la perdita in fase di rientro dello space shuttle Columbia e di tutti e sette i membri del suo equipaggio. Il "carico pagante", che comprende gli eventuali satelliti da lanciare nello spazio e/o i moduli scientifici ancorati nella "baia di lancio" dello space shuttle, viene inserito nell'apposito contenitore nella Payload Changeout Room, la speciale sala in condizioni climatiche controllate e totale assenza di polvere e impurità, che è uno dei luoghi più asettici che ci siano. A sua volta il contenitore viene inserito nella stiva dello shuttle dalla quale, una volta aperto il contenitore, sarà lanciato in orbita oppure, come in altri casi coi moduli scientifici, sarà aperto per effettuare una serie di esperimenti scientifici. Il carico pagante di questa missione del Discovery include il Multi-Purpose Logistics Module Raffaello, il Lightweight Multi-Purpose Experiment Support Structure Carrier (LMC) e l'External Stowage Platform-2 (ESP-2). Il Raffaello sarà consegnato come fornitura all'International Space Station nel quale ci sono pure cibo, vestiario e equipaggiamento scientifico per ricerca. Il LMC porterà con sè un rimpiazzo del Control Moment Gyroscope e una scatola di campioni per riparare le piastrelle dello shuttle. L'ESP-2 è fornita con parti di ricambio. I media si sono radunati davanti all'Operations and Checkout Building per seguire le fasi del lancio dello space shuttle Discovery. Dalla tragica precedente missione sono trascorsi due anni e mezzo. Cliccando l'immagine l'aprirete a 6019 x 800 pixel. L'equipaggio della missione STS-114 che volerà sullo Space Shuttle Discovery è quì ripreso nella fotografia ufficiale. 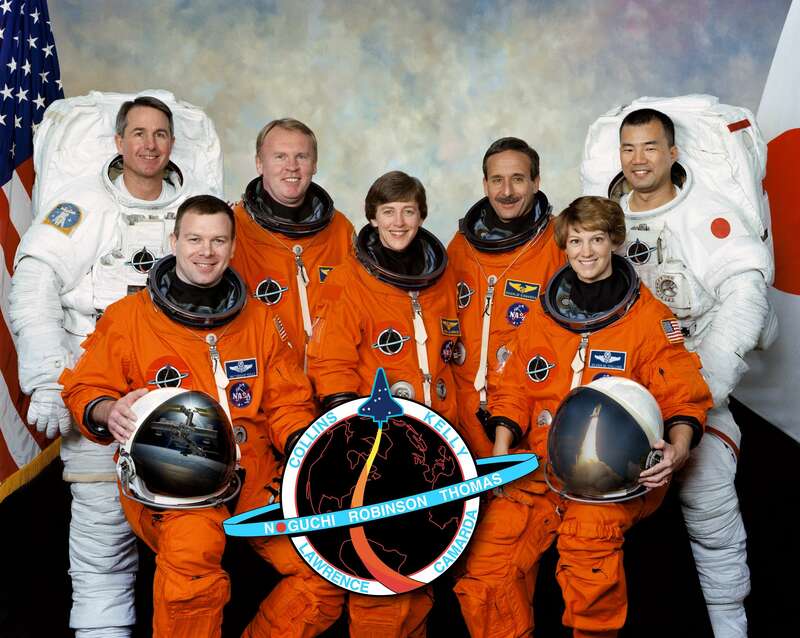 Da sinistra sono gli astronauti Steve Robinson, Jim Kelly, Andy Thomas, Wendy Lawrence, Charlie Camarda, Eileen Collins e Soichi Noguchi, quest'ultimo dell'Agenzia Spaziale Giapponese. Cliccando l'immagine l'aprirete a 3008 x 2004 pixel. Di seguito riporto le schede biografiche dei sette membri dell'equipaggio, tratte dall'apposita pagina del sito internet della NASA. Il testo in americano sarà tradotto quanto prima. 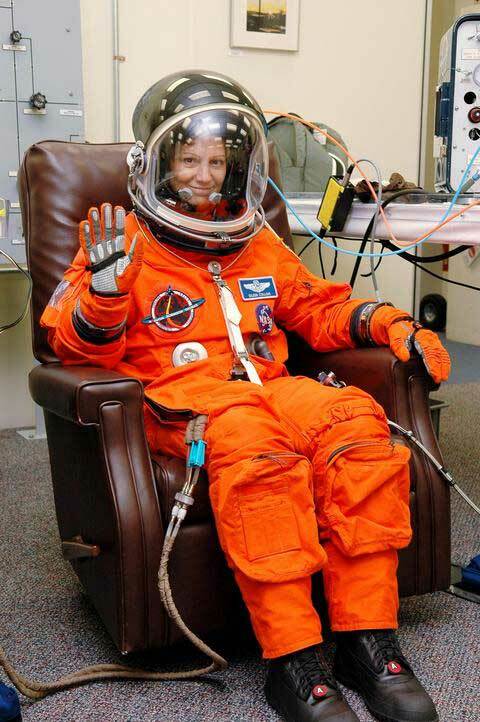 Eileen Collins will serve as commander on her fourth Space Shuttle flight and second flight as commander. She served as pilot on mission STS-63 in 1995 and mission STS-84 in 1997, and was commander on mission STS-93 in 1999. Collins will command the crew and mission on orbit. She will dock Discovery with the Station and fly the orbiter to its landing at Kennedy Space Center. Collins has Masters Degrees in operations research from Stanford University and space systems management from Webster University. She was born in Elmira, New York. During Crew Equipment Interface Test activities at Kennedy Space Center in February, Commander Collins inspects the window in Discovery's cockpit. During the interface test, the STS-114 crew had an opportunity to get a hands-on look at the payloads they'll be working with on orbit. Collins recently talked about mission STS-114 and the goals the astronauts aim to achieve. "Well, the LF stands for logistics flight. I mean, primarily, STS-114 is a resupply, re-servicing, repair of the International Space Station. But we also have an objective of the flight that's equally as important and that's the test -- I mean, you could call this a test and logistics flight because the testing that we're doing is for the recommendations that came about after the accident in the inspecting, inspecting the exterior of the orbiter and the External Tank and testing repair methods. So we really have, I see it as, as two major objectives on the flight." James Kelly will serve as pilot on his second Space Shuttle flight. He served as pilot on mission STS-102 in 2001. During mission STS-114, Kelly's primary responsibility is to serve as backup to Commander Collins. He will operate the orbiter's robotic arm during vehicle inspections with the OBSS. He will also operate the Station's robotic arm during all three spacewalks, as well as during the transfer and retrieval of the Multi-Purpose Logistics Module. Kelly has a Masters Degree in aerospace engineering from the University of Alabama. He was born in Burlington, Iowa. During a visit to Kennedy Space Center, Kelly looks closely at an area of an engine on the orbiter Discovery inside the Orbiter Processing Facility. Kelly recently spoke about his primary responsibilities as pilot for mission STS-114. "Well, the primary job of the pilot in, in every flight, obviously, my first job is to back up the commander. So, Eileen Collins is our commander, and although she's totally competent to do absolutely everything, we never do everything with one person. We always have someone to back them up. So my primary job is to back up Eileen pretty much in anything she does: flying the vehicle, reconfiguring the vehicle, all those kind of things, so that's my job number one. Probably the second biggest job I have is robotics for this flight. I'm a robotics operator on both the Shuttle arm, helping out with all the inspection processes, with the inspection boom and sensors and all of those things, as well as I'm a Station robotic arm operator, primarily for doing all of the EVAs, all of the spacewalk work, as well as the logistics module back and forth, onto the Station and back in the payload bay. So most of my time in flight is going to be taken up with the robotics operations." Soichi Noguchi, with the Japan Aerospace Exploration Agency, will serve as mission specialist 1. This is his first Space Shuttle flight. During the mission, Noguchi will be the lead spacewalker during three spacewalks to demonstrate repair techniques on Thermal Protection System samples, replace a failed Control Moment Gyroscope and install the External Stowage Platform on the Station. Noguchi has a master of engineering degree in aeronautical engineering from the University of Tokyo. Noguchi was born in Yokohama, Kanagawa, Japan. During preflight training, Noguchi checks a potential repair technique for the Shuttle's heat protection tiles at the Neutral Buoyancy Laboratory at Johnson Space Center in Houston, Texas. The latest techniques and hardware were developed for Noguchi to use during an in-flight test of new Shuttle heat shield repair possibilities on mission STS-114. Noguchi recently talked about what will be accomplished during his first spacewalk, along with Mission Specialist Stephen Robinson. "The first EVA, first spacewalks, will be mainly dedicated to demonstration of the repair techniques. Steve and I will move to the cargo bay, the very back portion of the cargo bay, and there is a special box dedicated to this demonstration. And it's the size of like, four feet by three feet. And we will open this big box, and inside the box there is a kind of a simulated damage of the tiles and, uh, possibly RCC, the leading edge panel, and we will be performing the repair using a special repair equipment. And, what we like to do is shoot the goop into the grooved area of the tile and see how it cures and how we can operate the equipment under the zero G and other vacuum environment. And once we come back to ground, then engineers will put them onto the arc jet test facility to make sure they will withstand entry profile." Dr. Stephen Robinson will serve as mission specialist 2 on his third Space Shuttle flight. He will serve as the flight engineer during the launch and landing of mission STS-114. Robinson will perform three spacewalks with Noguchi to demonstrate repair techniques on all protection system samples, replace a failed Control Moment Gyroscope, and install the External Stowage Platform on the Station. Robinson has a Ph.D in mechanical engineering, with a minor in aeronautics and astronautics, from Stanford University. He was born in Sacramento, California. During preflight training, Robinson uses virtual-reality hardware in the Space Vehicle Mockup Facility at Johnson Space Center to rehearse some of his mission STS-114 duties. Robinson commented on his primary mission responsibilities. "My job on this mission is really two separate things. On launch and on entry, I'm flight engineer on board, which means Eileen [Collins], as the commander, and Jim Kelly, as the pilot, will be sitting in their seats, and I sit in a seat sort of a little behind and in between them, and I'm responsible for understanding all the systems of the Space Shuttle, helping the right information flow get to the right person in the cockpit, and in particular, that becomes important when there's any malfunctions. In flight, there's not too many malfunctions, but in training there's lots of them, so we get to train for lots of, be ready for anything, basically. So I'm part of the cockpit crew. While we're up there, my job is to be a spacewalker, and Soichi Noguchi and I will do three different spacewalks on the fifth, the seventh, and the ninth day of the mission." Dr. Andrew Thomas will serve as mission specialist 3 on his fourth Space Shuttle flight. Previously, he flew on mission STS-89 in 1998, which was a docking mission with Mir. Thomas served aboard Mir as flight engineer 2 for 130 days and returned to Earth on mission STS-91 in June 1998. Thomas will help unberth the OBSS in Discovery's payload bay and attach it to the orbiter's robotic arm to inspect the vehicle for any damage. Thomas was born in Adelaide, South Australia. He received a Ph.D. in mechanical engineering from the University of Adelaide. During the March Crew Equipment Interface Test at SPACEHAB in Cape Canaveral, Thomas checked out components on the External Stowage Platform-2. The platform, carried in Discovery's payload bay, will carry replacement parts, known as orbital replacement units, to the Station. Thomas recently commented on how the Space Station will help the nation achieve the Vision for Space Exploration and pave our future. "...a lot of people don't understand that the Space Station and what we're doing with it is really going to help us go beyond low-Earth orbit. And it's a connection that a lot of people don't appreciate. If you're going to go beyond low-Earth orbit to the Moon or a six-month journey to Mars, you have to have systems in your spacecraft that you know will run continuously for long periods of time. You're going to have the right life-support systems, you've got to have the right electrical systems, propulsion systems. Everything has to work properly because when you do a mission to Mars there's no going back. If something's wrong, you can't just get down to Earth and fix it. The Space Station is going to teach us how to do that. It's teaching us what kind of technologies you need to operate and maintain a spacecraft in the hostile environment of space for long periods of time as you would have to do if you were doing a deep-space interplanetary mission. That's one thing. There's the human element, too: Space Station's teaching us what is required of us as humans to live and function in space. It's teaching us what is the consequence of living in space on us as human beings, and it's teaching us how to mitigate some of them, the deleterious effects, of space flight. We need to have answers to all of those questions if we're going to go on beyond low-Earth orbit to the Moon or to Mars." Wendy Lawrence will serve as mission specialist 4 on her fourth Space Shuttle flight. Previous missions include STS-91 in June 1998, STS-86 in September 1997, and STS-67 in March 1995. 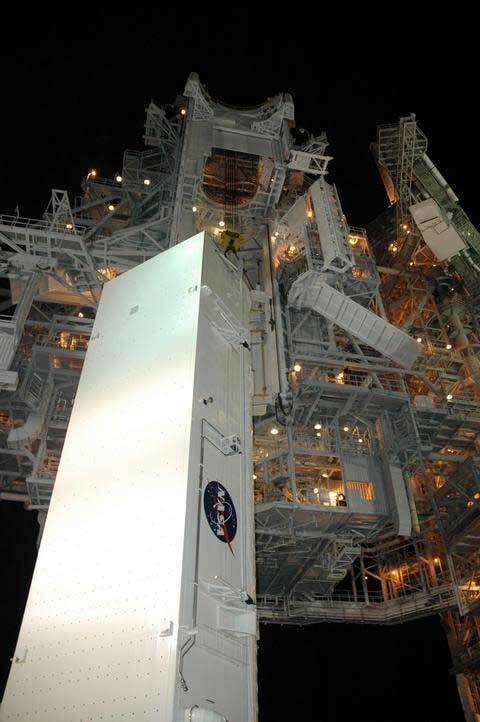 Lawrence's work on mission STS-114 includes helping to position the orbiter beneath the Space Station to allow Station crew members to photograph the underside of Discovery. She will also lead the transfer of racks from the MPLM Raffaello into the Station and the used supplies, equipment and hardware from the Station into the module for return to Earth. Lawrence was born in Jacksonville, Florida. She earned a masters degree in ocean engineering from MIT and the Woods Hole Oceanographic Institution. During the Terminal Countdown Demonstration Test on May 4 at KSC, Lawrence prepares to enter the hatch on Space Shuttle Discovery from the White Room on Launch Pad 39-B. 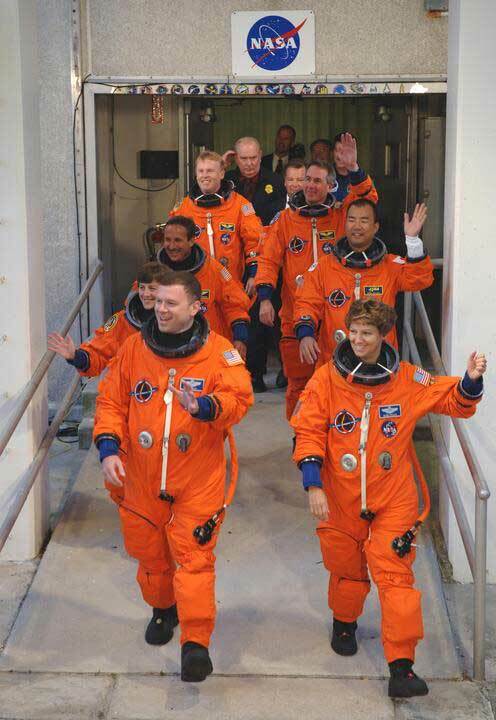 TCDT provides the crew of each mission an opportunity to participate in various simulated countdown activities. Lawrence recently talked about her primary responsibilities on mission STS-114. "I'm in charge of all the transfer operations, so the LF part of this flight designation is near and dear to my heart. We have a Multi-Purpose Logistics Module in the payload bay that's going to be carrying thousands of pounds of equipment and food and other items for the Space Station, and so we'll install that on Flight Day 4. And then we'll start the transfer operations and, hopefully by Flight Day 10, we've got everything done. We're actually on this flight bringing more back to Earth than we are taking up to the Space Station... A lot of the equipment on the Space Station is reusable, and it's time to bring it back down to Earth so it can be refurbished and flown again. And we're going to be bringing home quite a bit of equipment for the Russian space program, some of the rendezvous radar equipment that they use for the Progress and Soyuz vehicles." 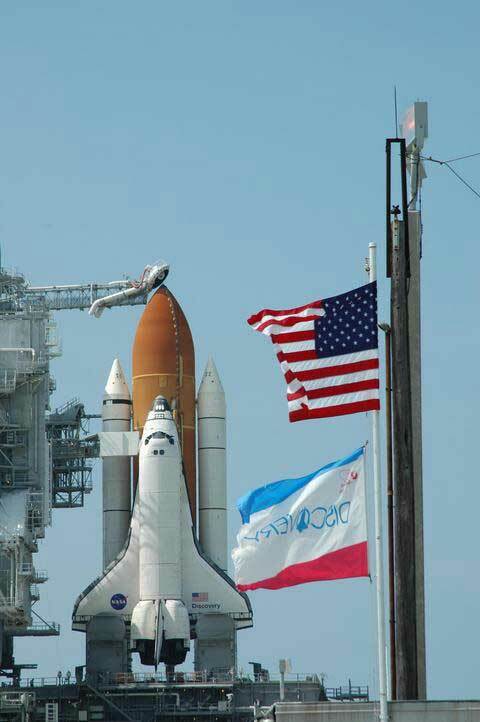 La comandante della missione che impiega lo space shuttle Discovery è Eileen Collins, una pilota che ha già volato con lo shuttle e vanta due lauree. Dotata di notevole sangue freddo, viene ricordata perchè in una precdente missione partì mentre si accendeva una spia che segnalava un "guasto" a pochi secondi dal distacco dalla rampa: svolse correttamente tutte le procedure del caso. La Collins è qui ripresa mentre si trovava nel "Operations and Checkout Building" al NASA Kennedy Space Center, con indosso la tuta e l'elmetto chiuso come in volo. A lei tocca l'onore di riportare la navetta in volo, a due anni e mezzo dal disastro del Columbia, e soprattutto di rifornire l'International Space Station che attendeva da tre anni le parti caricate nella stiva. Lo shuttle Discovery è sulla rampa di lancio, la Launch Pad 39B del NASA Kennedy Space Center, dopo il rollback della Rotating Service Structure di lunedì 25 luglio 2005. E' chiaramente visibile il gigantesco serbatorio esterno (External Tank) che è stato riempito di ossigeno e idrogeno liquidi dall'apposito sistema di rifornimento (visibile proprio sopra la punta del serbatorio). In fase di propulsione i due gas liquefatti sono riscaldati e, combinandosi, producono vapor acqueo e l'energia necessaria per la propulsione. Il serbatorio esterno è unito alla navetta vera e propria del complesso chiamato Space Transport System (STS), lo space shuttle, da una serie di attacchi esterni che potete vedere in un disegno della NASA. Al momento della partenza (liftoff), il serbatoio assorbe completamente il carico della spinta dei due booster laterali e dei tre motori principali, riforniti proprio dal propellente e dal comburente stivati nel grande serbatorio esterno, una spinta che è pari a ben 7,8 milioni di libbre, corrispondenti a oltre 3,5 milioni di kg(p). La rotazione all'indietro della Rotating Service Structure è la più importante operazione prima del volo; essa occupa la fase a 11 ore dal lancio e tipicamente avviene il giorno precedente: in gergo si dice "the T-11-hour hold on L-1 (the day before launch)". 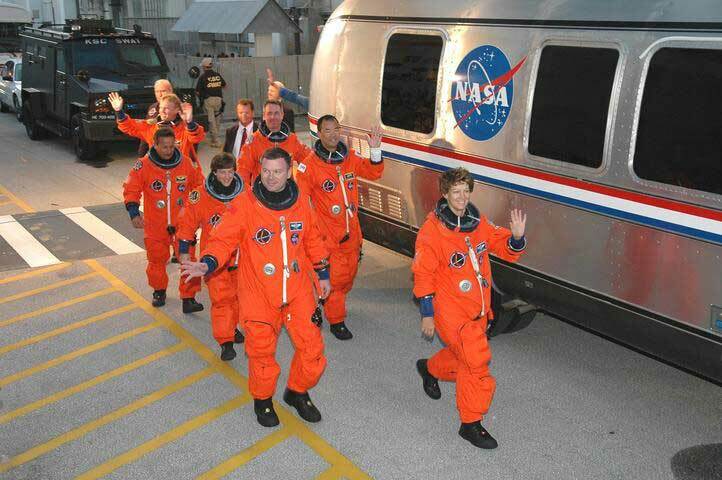 La comandante Eileen Collins (davanti sulla destra) assieme all'equipaggio della missione STS 114, ripresi a sinistra mentre escono dall'Operations and Checkout Building dove si sono vestiti e a destra mentre percorrono il tragitto verso l'autobus che li porterà al Launch Pad 39B, salendo il quale entreranno nella cabina dello space shuttle Discovery. I membri dell'equipaggio sono sette: Eileen Collins (comandante della missione), James Kelly (pilota), Andrew Thomas, Soichi Noguchi, Charles Camarda, Wendy Lawrence e Stephen Robinson (specialisti della missione).